Blanchard grinding is accomplished through rotary work motions, with the worktable rotating counterclockwise and the abrasive wheel rotating clockwise. All work pieces being ground receive the same treatment resulting in uniform size and surface finish. 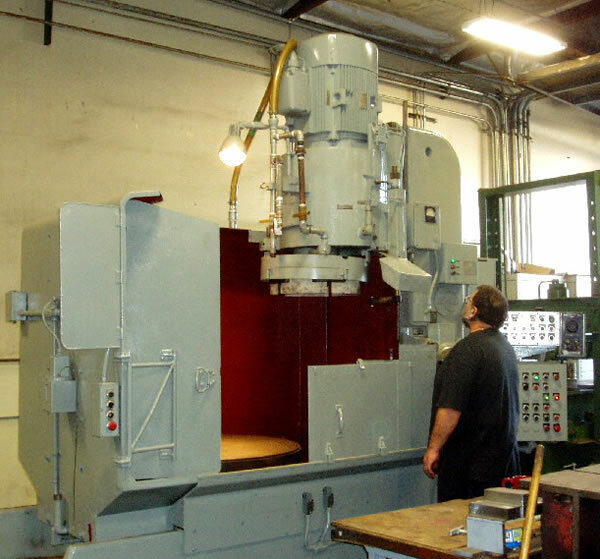 In 1909 the Blanchard Machine Company built the first vertical spindle rotary table surface grinder. The original Blanchard grinder established the concept known as "Blanchard Grinding." Blanchard rotary surface grinding features large stock removal rates on flat surfaces. Ferrous materials are held on a magnetic chuck while the opposite surface is ground, one side is ground at a time. Non-ferrous materials can also be ground, but require special work holding arrangements. Blanchard Grinding will leave its trademark cross-hatched surface finish pattern, typically within a 32-125 RMS range, though higher finishes are possible. Blanchard grinding (rotary surface) has a large stock removal rate on flat surfaces. Ferrous materials are held on a magnetic chuck while the opposite surface is ground. One side is ground at a time. Non-ferrous materials can also be ground, but require special work holding arrangements. Blanchard Grinding will leave its trademark cross-hatched surface finish pattern, typically within a 32-125 RMS range, though smoother finishes are possible. Dimensional tolerances to +/-.001", parallelism and flatness are achievable on all of our Blanchard Grinders. Because Blanchard Grinders use significantly greater horsepower than other methods, it is ideal for removing large amounts of material in a timely manner. Large parts such as steel plates, castings, and weldments can often be brought to size more economically than other methods of machining. A number of turns may be required to give a part the best flatness by relieving internal stresses equally. Blanchard Grinding eliminates mismatches, and speeds turnaround time on large parts.